Pennies 4 Preemies was so thrilled to be able to provide this hospital bed and comforter to our new friend Faith! This is I why I started Pennies 4 Preemies. I want to be able to help beautiful people like Faith. Smiling moment with Benson Odom. Thank you for being a supporter! Captured a moment with Ashley Byrd, Director of the Miss South Carolina Organization, while at an appearance. Thank you for all you do! 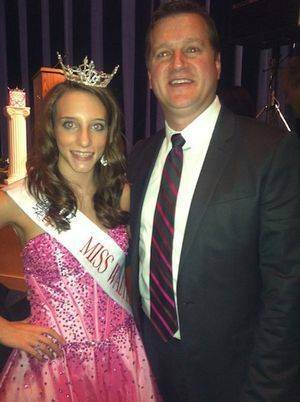 At an appearance as Miss Walterboro Teen with the wonderful Chaz Ellis! Cant wait for Miss South Carolina Workshop Weekend! Grace volunteering at Greenville Children's Miracle Network Hospital! Grace hanging out with an awesome group of TL Hanna students at the "Come Dream With Me" prom! Grace and her best friend Morgan Reynolds raising money at a local BI-LO! Grace posing with a local girl scout group! Grace with an amazing student at TL Hanna at the "Come Dream With Me" prom!" Grace and Ashton at the "Pancake Breakfast" fundraiser! Thank you to everyone who came out to support this great cause!!! We had a blast! The Mayer family means so much to me by the way they support "Pennies 4 Preemies"
Grace signing autographs and meeting new friends at the "Pancake Breakfast" fundraiser!! Grace and her beautiful Miss South Carolina princess dancing at the "Come Dream With Me" prom! Grace supporting her Miss South Carolina princess at her dance recital! Grace with the amazing and talented Brantley Gentry at the Miss Spartanburg Pageant! Grace and Miss Walterboro, Amanda Bishop, at the Miss Mauldin Pageant. Grace posing with the amazing Radio from the hit movie which tells the story of his life entitled, "Radio." She sees him everyday at TL Hanna High School and even made his birthday cake this year. Grace and Grant posing for a picture with Charlene the Beaver at the Anderson County Christmas Parade. Raising awareness at a food drive for Anderson interfaith ministries! Grace right after her crowning moment for Miss Walterboro Teen. She is looking so forward to all of the great memories she will make on this journey! With Miss South Carolina, Brooke Mosteller, at the grand opening of Curls and Crowns. I am so thankful to this wonderful business for supporting me on my journey to become Miss South Carolina Teen. race appearing at Curls & Crowns Grand Opening. She brought a few of her tasty "Grace's Gourmet" goodies! Another beautiful day and wonderful appearance with my sweet Prince and Princess. So blessed to have them supporting me! At an appearance with my awesome brothers, Austin and Brady. Thank you for always being there for me! A BIG thank you to my Prince and Princess, Grant and Ashton for coming out for the day to help with the Pancake Breakfast. I am so blessed to have you both on this journey with me and I am looking forward to creating so many more wonderful memories! It is always a wonderful experience when I am volunteering at GHS in the NICU. Love spending time at this incredible Children's Miracle Network hospital! Grace in her beautiful town of Walterboro. What a great town to represent! A BIG thank you to Valerie Flynn for being a business partner! She has a jar located in her business "Valerie's Treasure Chest" where she gains support and funds for "Pennies4Preemies." Grace with Lindley Mayer, Miss Greenville County 2013 and 1st runner up to Miss South Carolina. A big thank you to friend and business partner, Jared Beasley! Thank you for everything! Fun for Everyone! Come out and enjoy some amazing Ice Cream or Coffee Drink andhelp support Pennies 4 Preemies! Lots of prizes and fun! This is going to be a great Family Fun Event and your pet will LOVE you! Everyone come out and support the Get Fit Event hosted by Grace Cromer! We hope to see you all there. Details are located on the flyer. If you know any girls between the ages of 0 and 18 years old....please tell them about this pageant! EVERY contestant will win a crown! The pageant will be held on March 22nd at 11:30am and will be hosted by Miss Walterboro Teen, Grace Cromer and hosted by Tori Sizemore, former Miss South Carolina Teen USA. The judges will include; Lindley Mayer (Miss South Carolina Teen 2005 and 1st runner up to Miss South Carolina 2013), Brantley Gentry (TALK Magazines "Greenville's 10 Most Stylish" and Amanda Bishop (Miss Walterboro 2014). You don't want to miss this incredible event. Check out the flyer for more details!